Cyberflow is a 3D arcade with a distinct classical sci-fi feel and atmosphere, yet original controls, created specifically for touch screen devices. 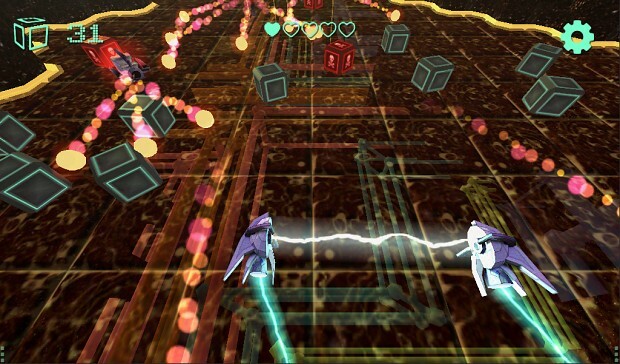 A variety of futuristic and surreal levels with procedurally generated layouts immerse the player in the world of cyberpunk, where Tron meets Podracer. The goal of the game is to steer the two parts of a "hoverbot" - a futuristic hover vehicle - through the levels while catching various crates in the arc and avoiding obstacles. Sounds simple enough, but Cyberflow is as challenging as it is addictive. All the levels have unique layouts and sets of powerups. Cyberflow has received a new update. And again a new type of obstacle is added to the game - turrets. The turrets are stationary, but aim at the hoverbot and shoot balls of plasma at it. The projectiles themselves are not hard to dodge, but can present a challenge combined with other obstacles. Turrets only appear on certain levels and shoot one projectile at a time at low levels and three projectiles at later levels. With the addition of this new challenge all the levels have been slightly rebalanced. The overall difficulty of obstacles has now increased, but to counter balance this, there are some extra changes. First of all, the way each level is started is slightly different: the player now starts the level at very low speed, gradually accelerating to normal speed. Also, the turtle powerup crates now reduce the speed of the moving obstacles and turret projectiles as well as the player, which makes this powerup a whole lot more attractive. Cyberflow update 1.1 available. Now with lasers! Today Cyberflow received an update that fixes several bugs, but also includes a new type of obstacle - lasers. Sci-fi themed 3D arcade for mobiles, Cyberflow, is released today on Google Play. As Cyberflow is approaching its release date, the soundtrack is live and free to listen and download on Soundcloud. Every time after I say I made an app: "So you're a software developer?" Like, no I'm a magical fairy who can wish software into existence.